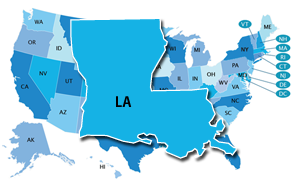 Louisiana has not adopted or made available a definition of college and career readiness. Dual Enrollment and Articulation Louisiana allows students to earn dual credit for academic and/or CTE courses through dual enrollment or the TOPS Tech Early Start award at their high school, postsecondary institution, online, or via other appropriate setting. Public postsecondary institutions are required to accept these credits (Education Commission of the States, 2015). Louisiana is not participating in the Early College High School Initiative (ECHSI); however, the Lake Area New Tech Early College High School is a Louisiana charter school that participates in ECHSI independent of the state. More information about schools participating in ECHSI is available at the ECHSI website (Capitol One-New Beginnings Charter School Network, n.d.; Jobs for the Future, n.d.). In addition, the Lafayette Parish School System (LPSS) and South Louisiana Community College (SLCC) have collaborated to establish the LPSS-SLCC Early College Academy (South Louisiana Community College, 2012). In 1998, Louisiana mandated that all students in Grades 8–12 have an Individual Graduation Plan (IGP) (U.S. Department of Labor, 2013). By the end of eighth grade, the IGP should include the required core courses to be taken through the 10th grade and should identify the courses taken in the first year of high school. By the end of the 10th grade, the plan should outline the school graduation requirements relevant to the student’s interests and goals. Annual review is required (Louisiana Handbook for School Administrators, n.d.). Louisiana’s Early Warning System is called the Dropout Early Warning System (DEWS). Data are reported for students in Grades 8–12 who exhibit characteristics of dropping out before graduation. Early Warning System data are reported at the student, district, and school levels to school leaders.